Is Big Pharma Peddling Hope or Providing Cures with Chemo? Harrogate District Hospital, North Yorkshire. 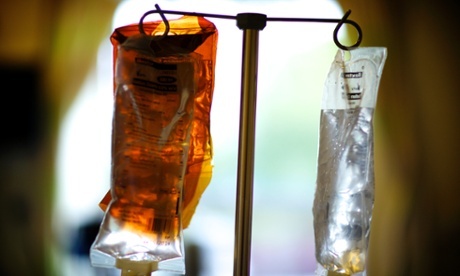 Chemotherapy bags. After failing two types of chemotherapy for advanced cancer, my patient knew that her lease on life was short, but a cherished family event stood in the way. “My son is going to propose at the Christmas table, I just want to make it there.” Her son has been her anchor throughout her challenge; I could see why his engagement mattered so much. But Christmas was still some months away, and I feared the feat will be difficult. “I am not afraid to die but I just want to know that I gave it my all.” This is an all too frequent exchange, unfailingly poignant, often heart-wrenching. An entirely reasonable answer would be to gently reiterate the lack of meaningful chemotherapy, broach the benefit of good palliative care, and allow for regret at both our ends. Contrary to popular belief that mythologizes every patient raging against cancer to the very end, for many this discussion eases the burden of expectation and allows for a peaceful end. But this relatively young mother was simply not ready yet. “I would happily die right after he proposed” she smiled, reminding me that her goalposts had never changed. When a patient like that looks you in the eye, it isn’t easy to separate foreboding statistics and human longing into two neat piles and deny hope. My head said that another chemotherapy drug wouldn’t make a significant survival difference. But my heart urged me to try, if not to boost survival, then merely to reassure her that she gave it her best shot. Put simply, we both knew that the gesture will be more therapeutic than the drug itself, hardly a rare observation in medicine. I wrote to a large pharmaceutical company for compassionate access to a common chemotherapy that’s not government subsidised for her precise type of cancer (most likely because patients typically don’t live long enough to need it). It is a relatively old and cheap drug, importantly with manageable toxicity, and I requested a month’s supply to gauge response. I added that the patient does not expect recurrent funding in case she responds to the drug, addressing a legitimate concern. In a world where we frequently push the boundaries or prescribe chemotherapy in more questionable circumstances, I feel comfortable that what I am really doing is asking the company to be my partner in nurturing hope. Which is after all what every pharmaceutical representative has told me for as long as I have known. So I simply don’t believe it when my request is declined. Thinking this to be a mistake, I protest further up the chain, pointing out to a senior executive that only recently the company had offered me conference sponsorship worth thousands more than the small cost of the chemotherapy. The apologies come fast, but the explanations are notably absent. My naive puzzlement slowly turns into the realisation that almost every instance where a company has facilitated compassionate access to a product, it has been as a form of marketing as a means of gaining lucrative, government-subsidised listing. In the era of astonishingly expensive blockbuster drugs, government subsidisation is the holy grail of big pharma. The cost of treating a few hundred or even a few thousand patients for free (and in the process, securing the backing of doctors), is negligible when the ultimate prize is full government subsidy. Indeed, individuals and organisations including the UK’s NICE and Australia’s PBS are now questioning the feasibility of subsidising drugs that can cost as much as AU$200,000 a year for ambiguous benefit. Compassionate access schemes for these incredibly expensive drugs might facilitate access for selected patients but they are not truly compassionate in the way that the average person understands. Pharmaceutical companies sell an ethically murky kind of hope than what doctors and their patients might understand. The benefit to the company must ultimately outweigh the benefit to the individual patient. If subsidy looks unlikely, access schemes are retired, sometimes abruptly. When a commonplace drug is neither vying for market recognition nor fighting for subsidisation, there is no incentive to provide it to a patient like mine, whose story would anyway never be the stuff of headlines. You might ask the obvious question as to why it would take so long for an oncologist to figure out that a pharmaceutical company is not a charity. The common argument is that companies must necessarily recoup the cost of drug development, as only a small minority succeed in the marketplace. But for every dollar spent on research, nearly twice is spent on lobbying and marketing – and it is also this expense that companies want to recover. From the time they are students, doctors are exposed to relentless advertising that big pharma is their companion in healthcare. The glory days of advertising saw doctors offered egregious forms of largesse, from conferences hosted in ancient castles and on cruises to lavish dining and entertainment. Then there were the rivers of pens post-it notes, stress balls and cute toys to influence prescribing. Regulation is much tighter today, but there is still plenty of money in sponsorships, paid speaking tours, adding one’s credible name to journal articles, and just promoting a drug to one’s peers, especially if you are anointed a key opinion leader. Drug companies think nothing of sending a representative to wait for three hours in a clinic to spend five minutes with a doctor. Unlike other people, these people never ever express frustration at the ludicrous wait and are unfailingly courteous. They ask subtly about you, your family and your holidays. They probe your prescribing habit and tell you why your peers prefer their drug. They routinely ask what would make it even easier for you to prescribe their drug. It is impossible to navigate the discussion towards cost or what makes for the greater societal good. And to be honest, it’s unseemly to be anything but polite towards someone who has waited hours to see you, seems genuinely nice, and from whom you might need a favour for your next patient. These favours are rare but the younger you are, the more impressionable. No wonder many medical schools and hospitals have banned pharmaceutical representative visits, hopefully signalling to doctors that the sandwiches have a hidden cost. Eventually, I tell my patient that my request for compassionate access was denied. Crushed, she asks if she wasn’t important enough. “That’s not true”, I say unconvincingly, “it’s just the way it is.” She dies, with a few weeks to go before Christmas, leaving me to wonder whether the drug might just have bridged the small gap. I will never know, but feeling morally compromised by the whole exchange, I tell the drug company that I won’t see its representatives in future. But “that one patient” represented the human face of what happens when the interests of a patient and the pharmaceutical company don’t align. That one patient’s crushed hope felt no less important than the renewed hopes of another. What happened with that one patient finally opened my eyes to what has gone before. It seems only right to start by paying tribute to my patient, while acknowledging my complicity in the thorny tangle of doctors, patients and drug companies. This entry was posted in Cancer, Cryoablation, Kidney Cancer, Magnetic resonance imaging, Surgery, Tumour and tagged Chemo, Chemotherapy, GL-W, Greg Lance-Watkins, Greg_L-W, Ranjana Srivastava Dr. Bookmark the permalink.